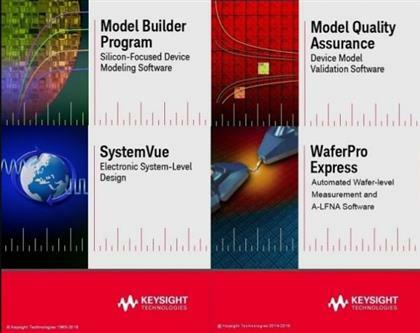 Keysight Technologies Inc. (NYSE: KEYS) is the world's leading electronic measurement company, transforming today's measurement experience through innovations in wireless, modular, and software solutions. Model Builder Program (MBP) is a complete Silicon turnkey device modeling software designed specifically for all tasks of baseband model extraction. It is a one-stop solution that provides both automation and flexibility for silicon device modeling. MBP includes powerful, built-in characterization and modeling capabilities as well as an open interface for modeling strategy customization. Its unique Task Tree architecture makes the model extraction process adaptable to specific data and enables users to stay concurrent with state-of-the-art modeling methodologies. Model Quality Assurance (MQA) is a Device Model Validation Software. It provides the complete solution and framework to fabless design companies, IDMs, and foundries for SPICE model library validation, comparison, and documentation. MQA provides semiconductor technology alliances and industry SPICE model QA standard and allows an open communication environment. MQA performs Model QA, comparison, and documentation automatically and ensures design success using advance process technologies. Electromagnetic Professional (EMPro) is Keysight EEsof EDA's electromagnetic (EM) simulation software design platform for analyzing the 3D EM effects of components such as high-speed and RF IC packages, bondwires, antennas, on-chip and off-chip embedded passives and PCB interconnects. EMPro EM simulation software features a modern design, simulation and analysis environment, high capacity simulation technologies and integration with the industry's leading RF and microwave circuit design environment, Advanced Design System (ADS) for fast and efficient RF and microwave circuit design.